So Iv’e gone to the rock gym a few times since my last post and I feel as if every time I go I can feel myself improving in some way. Tuesday I signed up for an adult technique class. Iv’e been climbing for a while now and I climb 5.9-5.11 so it’s not like I’m at a beginner level but I signed up for a few reasons. One, being that the grip in my left hand since I broke my thumb is not as strong as it used to be and two, because no matter how good at something you are you can always learn things from other people. There are only two other people in my class, a couple that seemed to be beginners. I was nervous that they were going to hold me back at first but they’re not at all and I actually like having them around. In the class I was told that I had to keep working on my pinches to strengthen my thumb which is hard because I have been avoiding them because I lost my strength. Tonight I am going back with my niece and tomorrow I may be going there twice with my friend and possibly with my brother later and I plan on doing a lot of pinch exercises. My goal is to have somewhat of strength back by Tuesday’s next class. Here I am after the adult technique class. I am a chalk warrior. In other good news, I am very proud to say that I have successfully lost 10lbs since December 1st. My goal is to lose 10 more pounds from here which shouldn’t be too difficult. My friend took a photo of me climbing a 5.10 the other day and I was able to notice that I lost weight in my photo. It felt pretty good. I also have been getting complimented on it so much. It feels awesome when people start telling you that they noticed you lost weight. I come from a very Italian family (a little too Italian if you ask me) and I eat a lot of pasta. I eat pasta 1-3 times a week. People always ask me how I managed to lose the weight and still eat pasta. The answer is simple. I eat a very healthy breakfast and lunch and eat at least 100grams of protein a day. I have a Herbalife shake for breakfast and one for lunch and a normal healthy meal for dinner or sometimes pasta. I eat plain, low-fat greek yogurt as a snack or a protein bar, and I work out A LOT. At least an hour a day either at the rock gym or at home. I also portion my pasta when I do have it and I usually make my pasta from scratch which has less stuff in it then store bought boxed pasta. The truth is if you take care of your body and work out and eat right you can get away with eating pasta a few times a week and still lose weight. So tomorrow is the day that I attempt to climb my first crack at the gym. I don’t know why but I’m a little nervous. I know I shouldn’t be because it’s in a gym and it’s my first time. I think it’s more of the fact that I don’t know how to fail. If I ever can’t acomplish a rout it eats away at me until I finish it. And I always do finish it with some practice. I guess I will just have to see if I can acomplish myself tomorrow. After all, the saying is true, “it’s not the wall we conquer but ourselves”. Today was quit the busy day for me so I didn’t get a chance to go to the gym so I had to work out at home. Today I focused mainly on lower body. 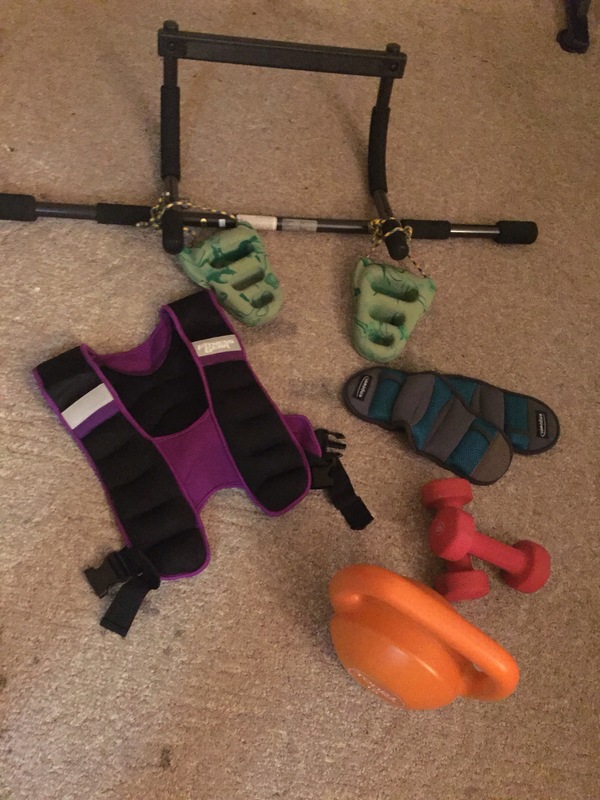 Rock rings, a weighted vest, wrist/ankle weights, standard weights and a kettle bell. I also have some yoga supplies and a few resistance straps not photographed. With the rock rings I do different pull ups, dead hangs and ab exercises with the weighted vest on. I also do sit ups and push ups with the weighted vest on and will even go for a quick jog while wearing it. When doing ab work outs at home I like to get 5-7 different floor ab exercises and do each one for a minute each. I will sometimes repeat this depending on what else I am doing or trying to focus on. After exercising I will often have a protein shake or a meal containing high protein. I am big into Herbalife and swear by their products. I have two protein shakes a day, a high protein snack and a healthy meal. Tonight I made grilled chicken and it was delicious! 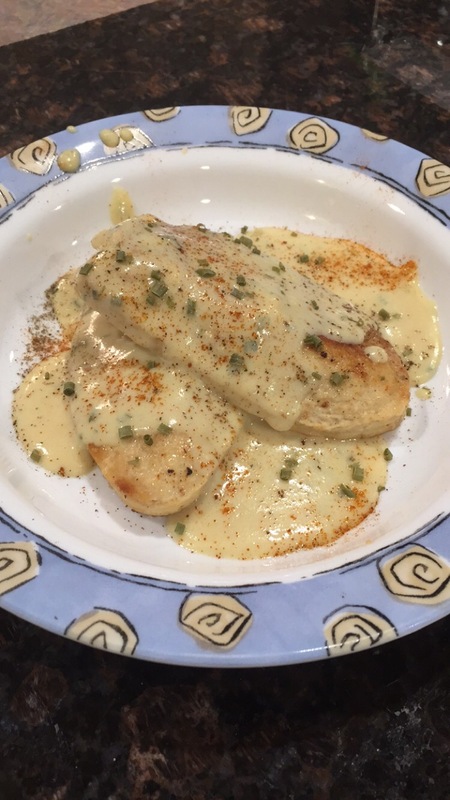 I used the Herbalife chicken soup mix to make a sauce containing 16grams of protein. Instead of adding a cup of water to the soup mix I added half of a cup to make it a thick and creamy sauce. I then topped it off with fresh chives and a sprinkle of pepper and paprika. It was a good, high protein meal, and made me feel good after a little at home work out!